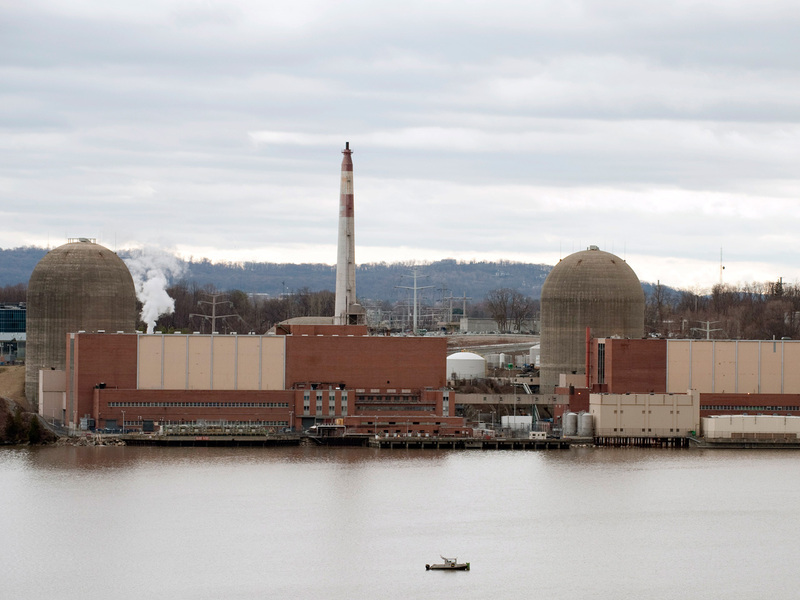 BUCHANAN, N.Y. - Part of a nuclear power plant remained offline Sunday after a transformer fire created another problem: thousands of gallons of oil leaking into the Hudson River. At an afternoon briefing, New York Gov. Andrew Cuomo said emergency crews were out on the water near Buchanan trying to contain and clean up the transformer fluid that leaked from Indian Point 3. "There's no doubt that oil was discharged into the Hudson River," Cuomo said. "Exactly how much, we don't know." The transformer at the plant about 30 miles north of midtown Manhattan failed on Saturday evening, causing a fire that forced the automatic shutdown. Cuomo revealed Sunday that even after the blaze on the non-nuclear side of the plant was quickly doused, the heat reignited the fire, but it was again extinguished. Oil in the transformer seeped into a holding tank that did not have the capacity to contain all the fluid, which then entered river waters through a discharge drain. Joseph Martens, commissioner of the state Department of Environmental Protection, said measures were taken to keep the oil from spreading, including setting up booms over an area about 300 feet in diameter in the water. The cleanup should take a day or two, Cuomo said. A spokesman for the Nuclear Regulatory Commission said several thousand gallons of oil may have overflowed the transformer moat. The reactor itself was deemed safe and stable throughout, said a spokesman for owner Entergy Corp. The plant's adjacent Unit 2 reactor was not affected and remained in operation. The Indian Point Energy Center in Buchanan supplies electricity for millions of homes, businesses and public facilities in New York City and Westchester County. CBS New York reports the blaze led to sirens going off at the plant, and a loudspeaker message declaring "This is not a drill." "These situations we take very seriously. Luckily this was not a major situation. But the emergency protocols are very important," Cuomo said Saturday. "I take nothing lightly when it comes to this plant specifically." The transformer at Indian Point 3 takes energy created by the plant and changes the voltage for the grid supplying power to the state. The blaze, which sent black smoke billowing into the sky, was extinguished by a sprinkler system and on-site personnel, Entergy spokesman Jerry Nappi said. Westchester County police and fire were on site as a precaution. It was not immediately clear what caused the failure, or whether the transformer would be repaired or replaced. Nappi said there were no health or safety risks. Officials did not know how long the 1,000-megawatt reactor would be down. Entergy is investigating the failure. Cuomo said there had been too many emergencies recently involving Indian Point. Unit 3 was shut down Thursday morning for an unrelated issue - a water leak on the non-nuclear side of the plant. It was repaired and there was no radioactive release, Nappi said. In March, Unit 3 was shut down for a planned refueling that took about a month. "We have to get to the bottom of this," the governor said. Diane Screnci, a spokeswoman for the U.S. Nuclear Regulatory Commission, said an agency inspector was at the site Sunday and the agency would follow up as Indian Point assesses the affected equipment. She said there was no impact on the public, and it was not out of the ordinary for a transformer to have a problem. The environmental watchdog group Riverkeeper issued a statement Sunday saying the latest Indian Point accident proves that the plant should be closed for good. Carl Lundgren of the grassroots group Shut Down Indian Point Now told CBS New York that its proximity to people is its biggest problem. "It wouldn't even be allowed to be constructed today because of the density of the population up there now," he said.